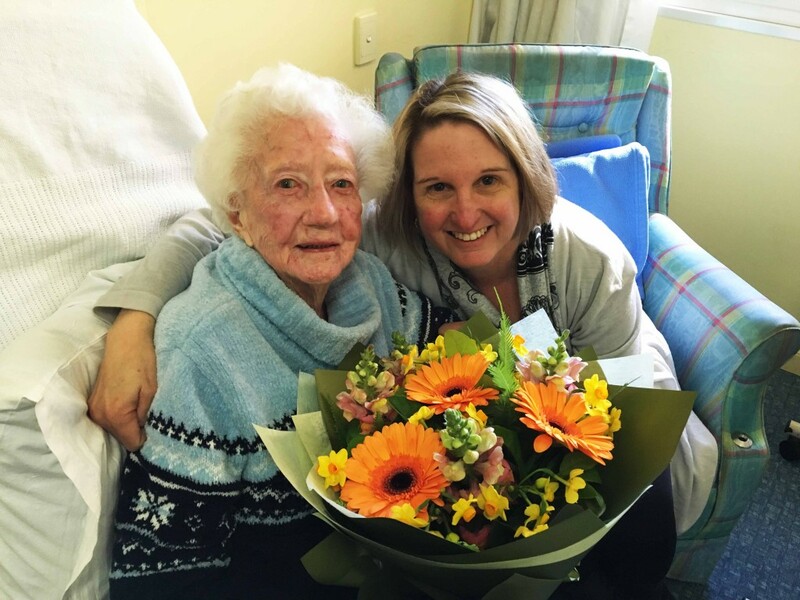 Mrs Quinn, veteran widow and a client of ours for just under a quarter of a century is going in to residential care near her family on the Fraser Coast just before her 103rd birthday. Much to Mrs Quinn’s disappointment as she doesn’t want to leave her home yet but she is pleased that she’ll see her family more often. Mrs Quinn became a client of Jubilee Community Care after having a fall and breaking her hip. In order for her to return home, her family engaged our services. 24 years on, we were still a part of Mrs Quinn’s life and her of ours. Everyone at Jubilee knows Mrs Quinn and the stories are full of warmth and laughter. Pam, our Finance Administrator Assistant, who has been with us 10 years, bonded with Mrs Quinn when she was a care worker for her as they both wore the perfume “Paris”. Our Client Support Manager Nicky, who is celebrating 9 years with Jubilee this year, was also Mrs Quinn’s care worker and then her coordinator. Nicky has only fond things to say about the wonderful centenarian. “Mum became very attached to some of her carers and on the other hand was not backward in letting us know that she didn’t like some others. I was always told that someone was coming from Jubilee, so not to park my car in the carport. Her 100th birthday was a great celebration and I would like to thank Jubilee for their participation on that happy occasion. We have a wonderful book of memories prepared and printed by your organisation. She is really amazing for her age and we are only too happy to recommend Jubilee Community Care for their care for nearly a quarter of a century, in which time some dozen or more carers have been involved with Mrs Veronica Mary Quinn. Once again thank you for your care and interest.” ~ Suzanne, Mrs Quinn’s daughter. We will all miss her greatly but wish Mrs Quinn and her family all the best! Thank you for being part of Jubilee’s history Mrs Quinn.